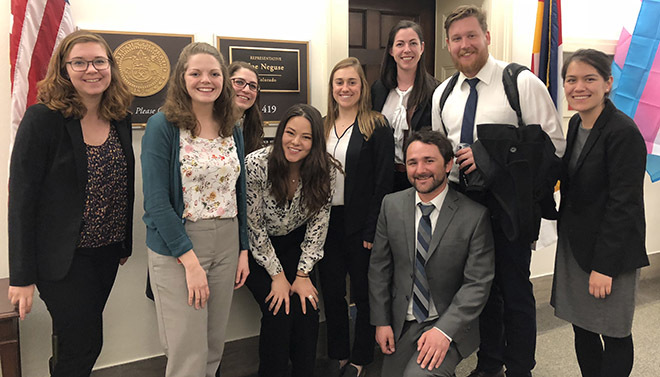 Each year CSTPR hosts a competition to send CU Boulder students to Washington, DC to attend the AAAS “Catalyzing Advocacy in Science and Engineering” workshop. During the workshop portion, the winners learned about the structure and organization of Congress, the federal budget and appropriations processes, and tools for effective science communication and civic engagement. In addition, the winners participated in interactive seminars about policy-making and communication. Below are comments by the winners about this year’s workshop. My first trip to Washington, D.C. to participate in the 2019 AAAS Catalyzing Advocacy in Science and Engineering (CASE) was a whirlwind tour of science policy in the nation’s capital. From former members of Congress, to current Hill staffers, to federal science agency employees, each of the workshop’s sessions revealed a different role that science plays in policy. Among many topics, we learned about United States science and technology policy history, the federal budget process, Congress’s structure, and how scientists can better engage in policy. Each session left me wanting more and often with more questions than before the session began. One important topic that was pressed upon us during the workshop was the importance of understanding the mechanics of the federal government, specifically the federal budget process. Admittedly, before attending the workshop, the thought of two full sessions dedicated to the federal budget process sounded dry. However, science can’t happen without funding, and learning about the intricacies of such an important process for science was fascinating. For example, shortly before we arrived in D.C., the President released his budget and proposed massive cuts to science funding. The budget made its rounds through media outlets and caused quite a stir. However, through the workshop, we learned about how Congress controls the budget and how members of Congress from both political parties considered the President’s budget “dead-on-arrival” and a “non-starter” (for most President’s budgets too, not just our current President). We also learned about how politicians with diverse interests in both the House of Representatives and Senate come together to create the budget, which is an even messier process than it sounds like. A memorable quote from the first night of the workshop was “law and sausage are two things you do not want to see being made,” and it certainly proved to be true. Read more of Katie’s comments about the workshop. This workshop was far more informative and impactful than I anticipated when applying, and I had high expectations after reading the reflections from last year’s students. Although I’ve always known that I love talking about astronomy, I never considered communicating science outside of an educational space or even thought about what exactly science policy is. That all changed in the space of a few days, when I had the opportunity to listen to consistently engaging and informative speakers and experience real Hill meetings. Although here I will focus on what I took away from the scheduled activities, one of my favorite parts about the workshop was interacting with other young scientists interested in advocacy. I had no idea there were so many others with a similar interest in communicating science, and all from wildly different disciplines. The fascinating people I met and great conversations had really helped me digest and consider everything we were learning. This experience has affirmed that I never want to become a politician, but I saw how vital it is for scientists to be able to understand how that very different world works. I reflected on the stark cultural divide between scientists and politicians, and the importance in being able to bridge that gap. One of the sessions presented a thorough introduction to the budget process. Although I won’t remember many of the specifics, it gave me an appreciation for the complexity behind supporting most major projects in my field. After learning about this, it’s astounding to me that many scientists aren’t more well informed about this essential process. Read more of Claire’s comments about the workshop. The AAAS Catalyzing Advocacy in Science and Engineering student workshop synthesized science policy issues, legislative processes, politics, and science advocacy into 3 intensive, exciting days. The opportunities to speak with our local policy makers, to practice mock appropriations processes, to discuss policy issues candidly, and to put sticky notes on Alexandria Ocasio-Cortez’s wall made the event an experience I will never forget. The take home message I took away from this year’s workshop was that in order to pass legislation and make a real difference, you need to align your politics, policy, and procedure. Even though I already study science and technology policy with Center for Science Technology Policy Research (CSTPR) graduate certificate program, there was an invaluable benefit to hearing from speakers whose boots were on the ground in Washington DC. As Judy Schneider, a Congressional specialist, pointed out: all of the concepts in the national discourse are large, complicated subjects like healthcare, climate change, affordable housing, drug pricing, immigration, etc. However, all of these issues differentially impact states which is why it is important to align local policies, local politics, and local procedures as you advocate for more science funding to your representatives. This idea of grounding policy, politics, and procedure locally certainly helped the Colorado delegation advocate effectively! Read more of Danielle’s comments about the workshop. The AAAS “Catalyzing Advocacy for Science and Engineering” Workshop in Washington DC was an insightful and inspiring experience. The seminars, presentations, and interactive activities provided exposure to a wide range of science and technology policy issues from an impressive suite of experts. The workshop offered an engaging crash course in Congress, the legislative process, and the federal budget and covered topics including STEM education, the role of federal agencies, and civic engagement. One of the greatest strengths of the workshops was the expertise of the speakers, presenters, and panelists. It was interesting to hear about the professional trajectories of people at all stages of their careers from recent graduates to lifelong public servants. Learning about their experiences and perspectives humanized policy. It was also insightful to hear about how the federal government works from people within it. They provided a more nuanced understanding of Congress and how its ultimate function is not to pass laws but to stop bad laws from passing. It was such a unique opportunity to learn about the structures and processes of Congress from the specialist who trains freshman lawmakers on procedural rules. Read more of Madeline’s comments about the workshop. This entry was posted in Announcements, Commentaries. Bookmark the permalink.